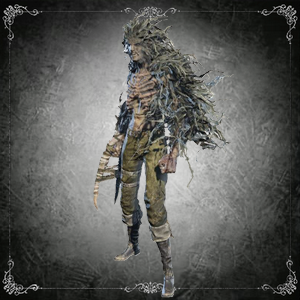 This enemy can be found at the dead end in the Hunter's Nightmare where Gilbert's house would be located in Central Yharnam. He uses the Beast Claw paired with the Beast's Embrace rune, granting him access to the weapon's alternate moveset; combined with his enormous reserves of health, this makes him an especially dangerous opponent no matter when you choose to face him. 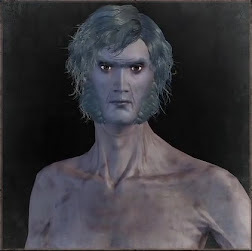 While the Bestial Hunter does not use firearms, he is a nimble enemy with powerful melee attacks whose fighting style places a heavy emphasis on evasion; he rolls and quicksteps frequently in battle, and will almost always dodge thrown weapons such as Molotov Cocktails. He will exclusively use the Beast Claws' transformed mode in combat and will occasionally perform the roar attack; he will also periodically attempt to hit you from a distance with the leaping dive, but this move will usually miss at close range. 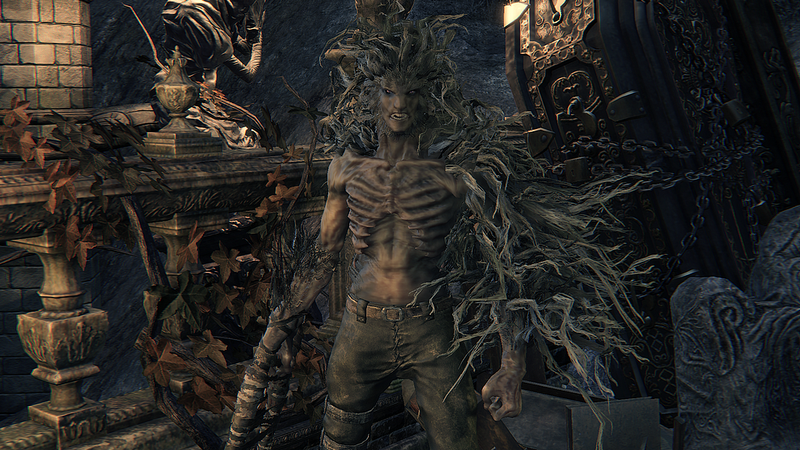 Despite his appearance, the Bestial Hunter is not affected by the damage bonuses from serrated weapons or Beasthunter gems. Stand just outside the reach of his claw swipes and interrupt him when he performs a slow attack. Trapping him in a corner with melee combos is effective as well, but his heavy use of evasive quicksteps can turn the tables if you press your advantage too far. The Wooden Shield will deflect his light attacks and can be used to set him up for retaliatory (R1) combos; charged attacks are effective as well, though staggering from behind is difficult due to his high mobility. The Whirligig Saw's transformed (L2) attack is especially effective for stunlocking him and a hit from the Beast Roar will send him flying. Fast weapons such as the Blades of Mercy are useful for trapping him in combos and preventing his escape; slower attacks will often miss if not timed carefully, but can be initiated after quickstepping forward through his swings to increase the chances of striking him during his recovery.